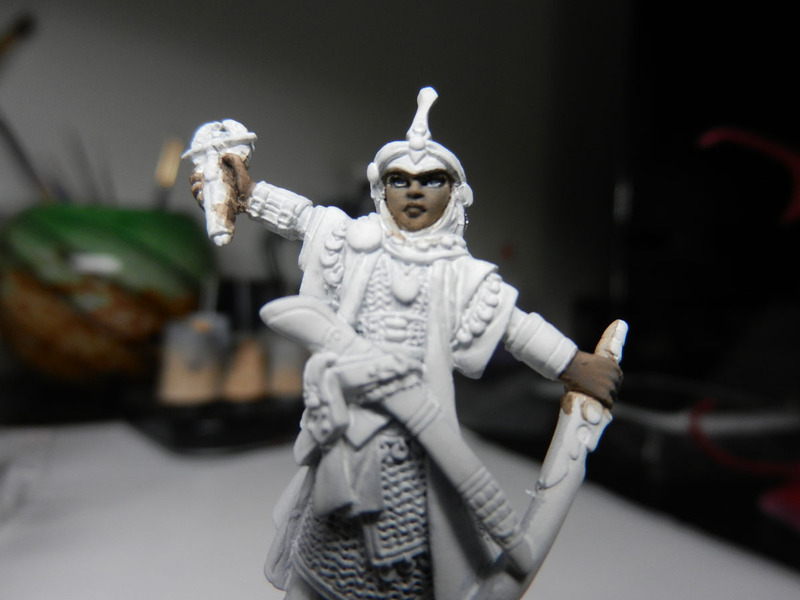 While waiting for the watery layers of Red Dragon to dry, I worked on Kyra’s face. Below is the artwork that I was sent to use as a reference. I used a base coat of Olive Skin Highlight and Dusky Skin. I mixed it about 50/50. Â A mix of Walnut Brown and a small amount of Black was painted into the eyes. 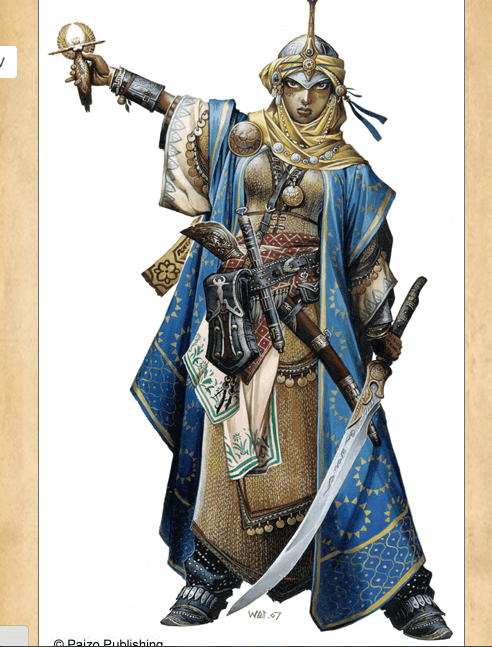 The picture below also has Seoni in there. 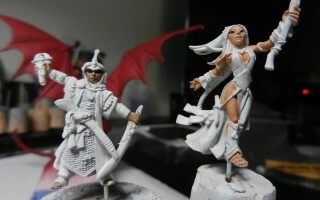 I started the base coat of skin on her but ended up concentrating on just the Dragon and Kyra. Â I thin my paints down to a watery consistency and build up a base coat in several thin layers. This way, I can layer up to the tone that I want without (hopefully) going beyond that. 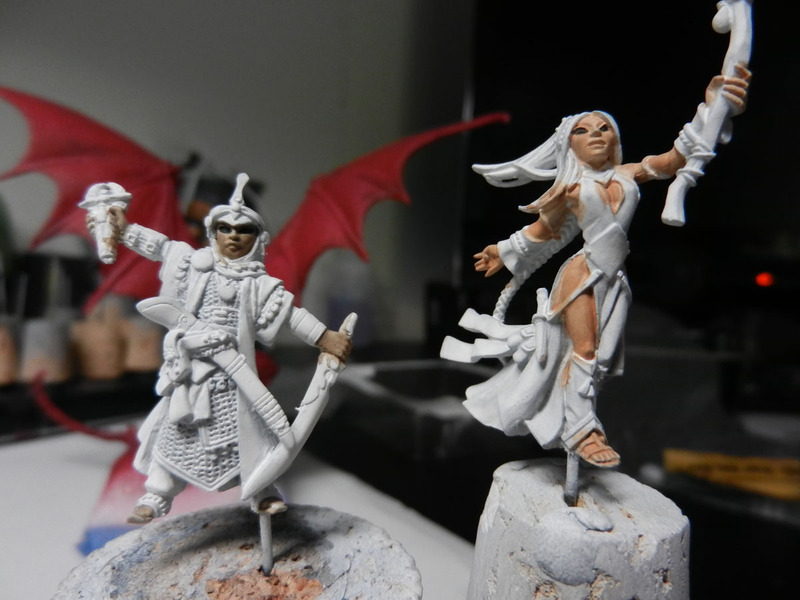 Using really thin paint can also add to the translucency of skin, depending on the skin tone that you’re going for. 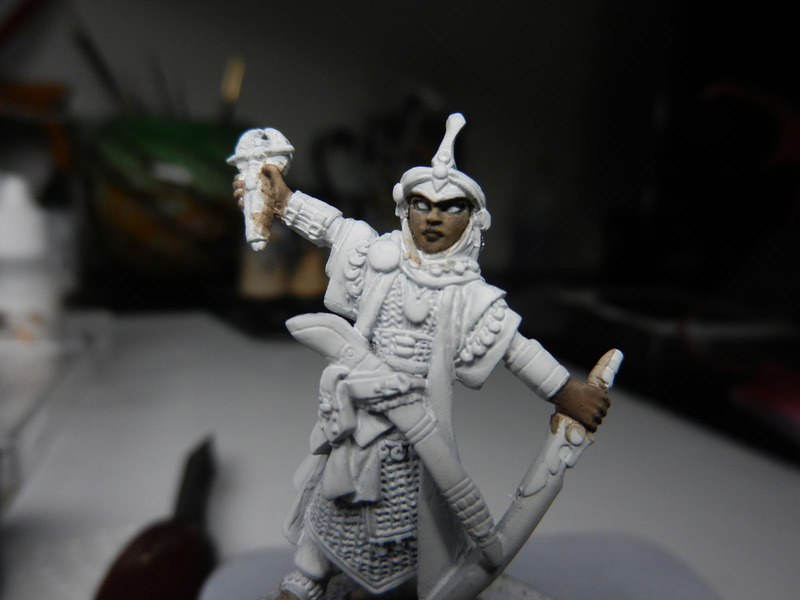 Next, I used Fair Skin Highlight to paint the whites of the eyes and darkened the outer edge with a little more black. 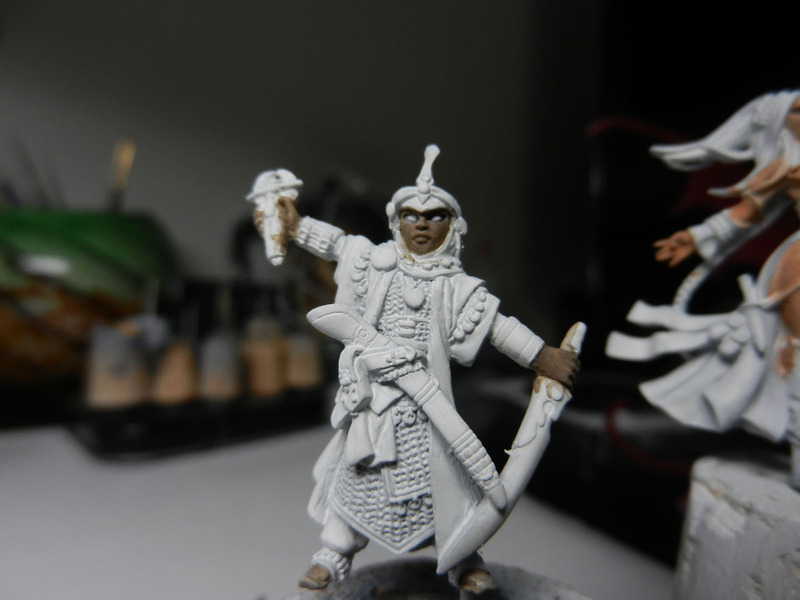 I think dark browns look a bit more natural but this model has a deep stare that is better outlined in Black. At this point, to keep my eyes from crossing, I started highlighting the face a bit. Each of the steps that I paint usually consists of three or four thin layers of paint to get the correct tone. I didn’t take pictures in between each because the effect is very slight and difficult to see with each layer but easier to see after a few. For these first highlights, I used the base color plus a little more of Olive Skin Highlight. I added very little at a time and washed over the higher points of the face a few times. Next, I added Dark Shadows for the eyeliner areas and lips. I carefully added the pupils with first Walnut Brown, and then decided to go to Black. I used the same techniques and color on the hands that I did on the face. The small tattoos under the eyes were painted with Ultramarine Blue (RMS). Throughout this process I added a small amount of Flow Improver to the mix whenever I had to paint fiddly areas such as the eyes and tattoos. Â It helps make the thinned paint flow with very little pressure. I added the helpful pictures here, but Â there were plenty of times that I had to chase extra paint out of the eyeball or lighten an area that ended up way too dark. It’s a game of experimentation and going between shading and highlighting until everything looks like it should. 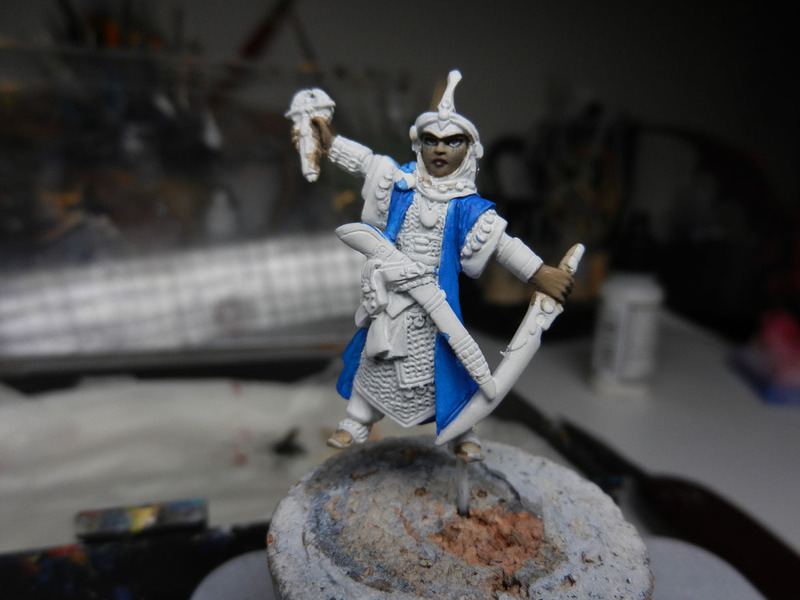 The Ultramarine Blue is also the base color of the robes. It doesn’t match the reference picture very well at this point but by time I’m done with the shadows and highlights, it will be a lot closer. I think skin tone is really difficult. When I paint in watercolors I use the same technique of several thin glazes. I think you did a great job. I can’t even imagine painting tattoos that tiny. Your brushes must be just one or two hairs thick! I used to fear painting skin until I learned how much to thin my paint. 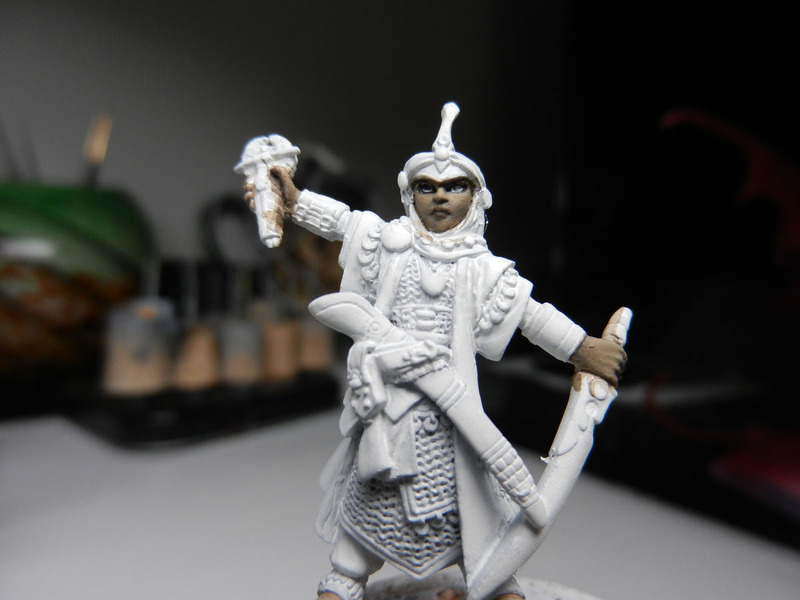 It can be done with thicker paint but I find it easier to deal with when the paint is very thin. The eyes and tattoos are a bit difficult for me. I tend to mess at least one side up and have to redo it. I have a lot of freehand design to do on this (and the other) figure. It’s going to take a lot of time and patience. I do have a brush that’s pretty tiny but not as small as you would think.